Resident viruses are viruses that make themselves at home within your computer. They secretly install themselves onto the hard drive and can perform unauthorized tasks and functions. If you’ve noticed PC slowdowns, long startup times, crashes, and other strange PC errors, then you may have a resident virus. Our recommended solution is to download and install the Repair Tool. This tool has been designed to remove resident viruses while also fine tuning the PC for maximum security and performance. Recommended: To remove a resident virus, use this software package: PC Cleaner Pro. This repair tool has been proven to remove resident viruses and fix other serious Windows problems with very high efficiency. What causes a resident virus? In most cases, resident viruses attack systems through no fault of the user. The user may have visited a seemingly innocent website, for example, only to have the resident virus silently install itself in the background. In other cases, resident viruses can spread through emails, infected USB sticks, or even public networks. When a resident virus attacks, users may not know they have a virus for months – or they may not discover the virus at all. Resident viruses can perform a wide range of dangerous functions once they’ve been installed on your system. They can steal personal banking information, for example, and monitor your daily activity on the PC. Sometimes, resident viruses display no symptoms, but in most cases, PC users will notice slowdowns, error messages, and crashes or freezes. PC Cleaner Pro instantly removes resident viruses by scanning the depths of Windows for any malicious software. When this software is discovered, PC Cleaner Pro permanently deletes it to ensure that the problem is unlikely to return. In addition to helping users discover how to remove a resident virus, PC Cleaner Pro optimizes hundreds of different aspects of PC performance and security. It cleans junk data from the hard drive, for example, and fixes registry errors. 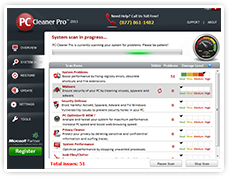 PC Cleaner Pro is one of the best ways to maximize PC performance while also enhancing the security of your system.